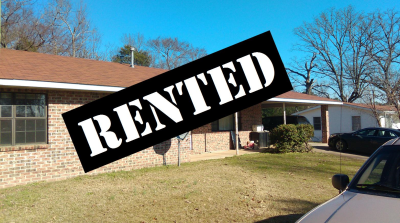 No Longer For Rent - 911-A Riddell St, Clarksville, AR. Quite location just west of the Forrester Davis Center. 2 Blks from the University of the Ozarks. Brick exterior, central H&A, 2 bedrooms, 1 large bathroom, cook stove and refrig included. New paint and floor coverings. Separate bldg in front of the attached single car carport has washer and dryer hookups. Anticipated move-in date Oct 10th. Landlord provides lawn care. Tenant pays utilities and trash service. $575 a month plus $575 security deposit ( ($1,150) on a 6 month lease, or $550 rent plus $550 security deposit on a 12 month lease. Tenant to have utilities turned on in tenants name prior to moving in. NO PETS, indoor or out. These are NON-SMOKING units. References will be checked. Apply in person at All Star Real Estate, 106 S. Fulton St, Clarksville. Mon-Fri: 9:00 - 4:00. Or request application by email.